During today’s blog post, we hope to provide you with some killer basketball drills that will help you prepare your team for battle mentally, physically, and emotionally. These drills will help getting them ready and get them to the proper mental focus so that they can be at their best. You spend time preparing your players each day in practice. Why would you value game preparation as any less important? What others see from your team on the floor is a direct reflection on you as a coach. If your players lack discipline in their game preparation, then it’s assumed you lack discipline in your basketball program. I know several NBA and college scouts who make an extra effort just to get to the game early to see how their prospect warms up before a game. They are looking for his discipline, mental toughness, sincerity, and value for the game, and his overall ability to prepare himself to compete. In a game of seconds, isn’t it important to have your players prepared to make the best decision possible in a split second? Proper game preparation will help your players make the right decision when it counts. During pregame warm-up drills is a great time for you as a coach to remind your players through a series of set drills what is fundamentally important to the success of your team. This pregame warm-up drill is a simple one to start out with; it gets your guys moving and passing, catching the ball at high speeds, and making lay-ups at high speeds. The ball starts underneath the basket. We have four players spread out on the perimeter at each corner. 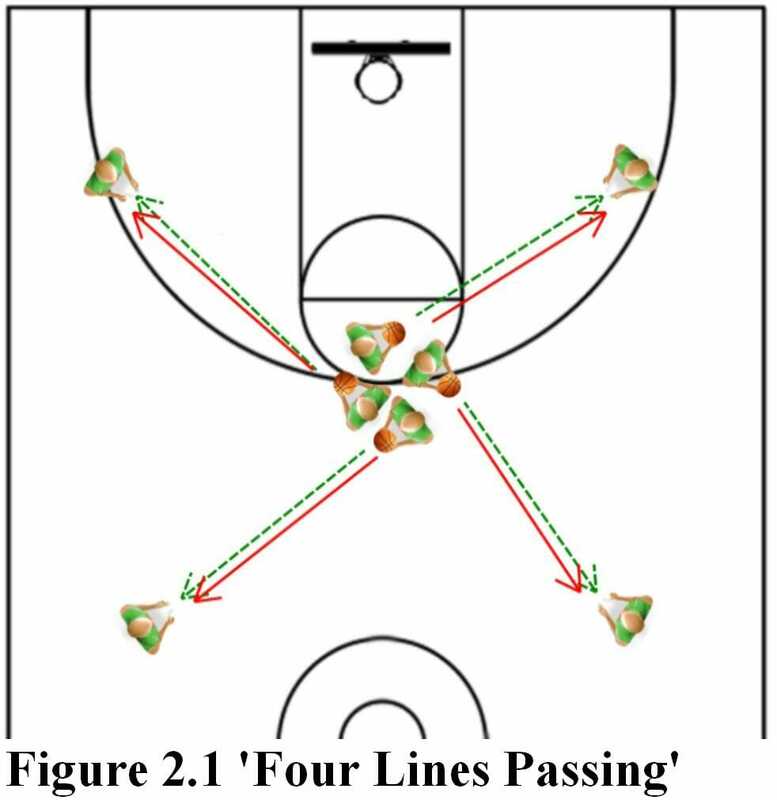 To start out, you’re going to pass the ball and follow your pass. 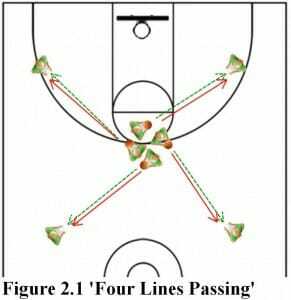 A player receives the pass, he makes his pass, he follows his pass, and he ets behind the person he just threw it to. As soon as this person catches the ball, he’s going to pass opposite and follow his pass. And he’s going to run behind his pass and get to that spot. The next person in line is going to throw across the court, catch it. As he passes, he’s going to follow his pass and ge t to where he passed it to. And the next guy in line is going to pass to your last man, who’s cutting to the basket for a lay-up. Again, the guy who passed it is going to follow his spot. 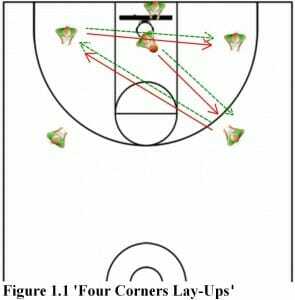 The guy who shoots the lay-up is going to run off the floor and as soon as the ball comes out of the net, the next man is going to grab it, and throw diagonally again to start the next possession. 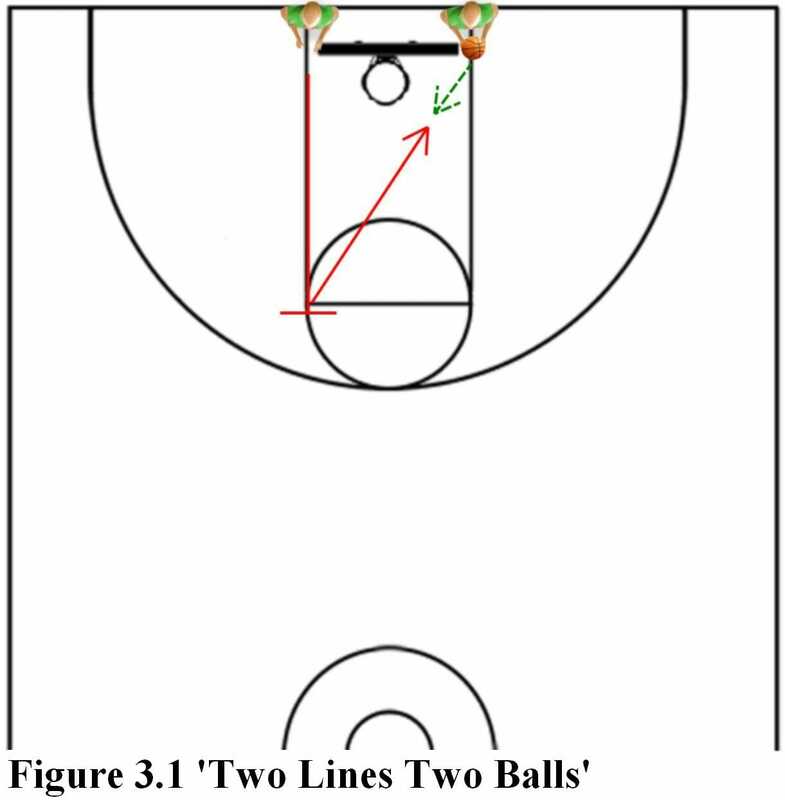 With this drill, the ball rarely touches the floor except for the man going in for the lay-up. That’s four-corner lay-ups. The ball is moving. Players are moving. You get good at passing. The hands are up. Players are catching the ball at fast speed and making the lay-up at fast speed. 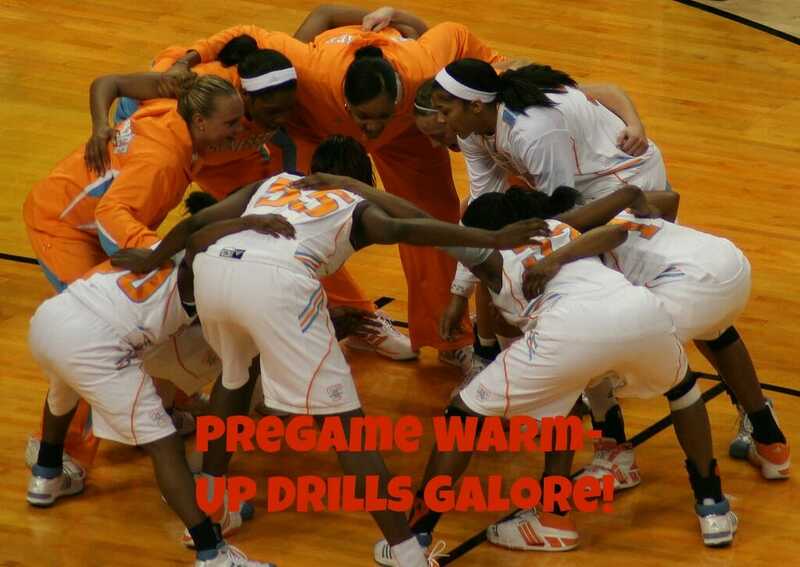 This next pregame drill is as old as the game of basketball. It is an excellent drill for working on your jump stops, your pivoting, and your passing. You’re going to have four passing lines. Each line is going to have a ball in it. Each line’s first player should drive at each other hard, through the middle. They’re going to drive hard at each other, come to a jump stop, a predetermined direction – and we’ll go to our left. 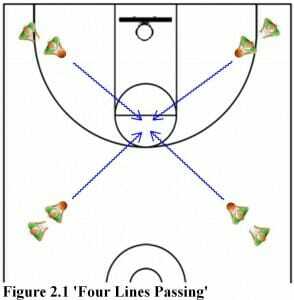 Each player’s going to reverse pivot and pass to the next guy in line, and they’re going to follow their pass. Then the next group drives in. Jump stop. Reverse pivot. Pass. 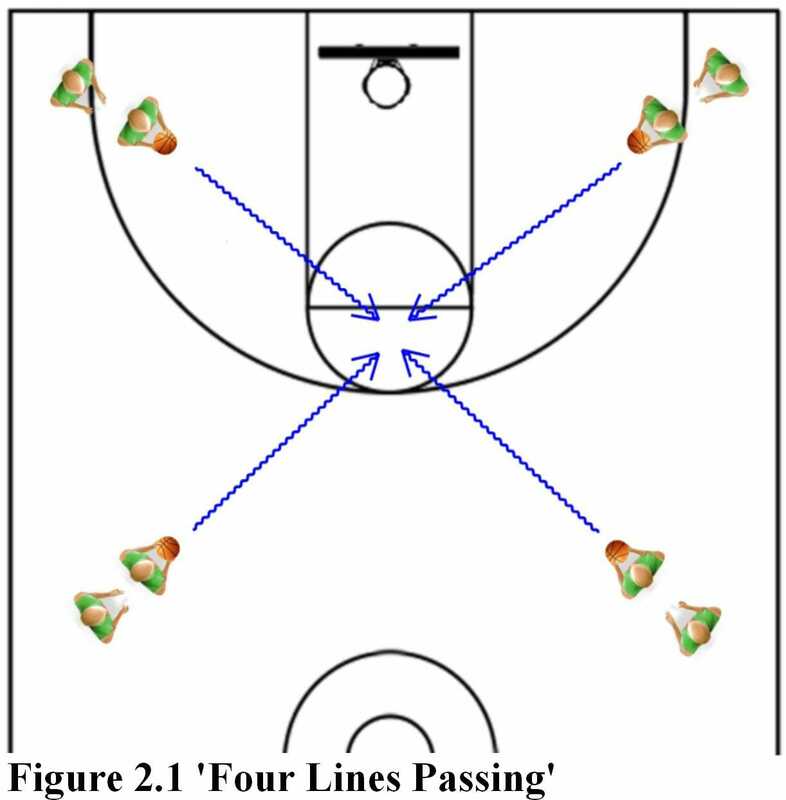 Now, like in any pregame drill it’s important that you continue to stress the basics. You can’t have guys just going through the motions. You want your guys to be thinking about doing things right. And that means coming to a good solid jump stop, a good pivot without traveling, a good two-hand chest pass, the receiver should have their hands up. This drill should go quickly. It’s to be sharp, but the ball should move and it should look very intense, very sharp. 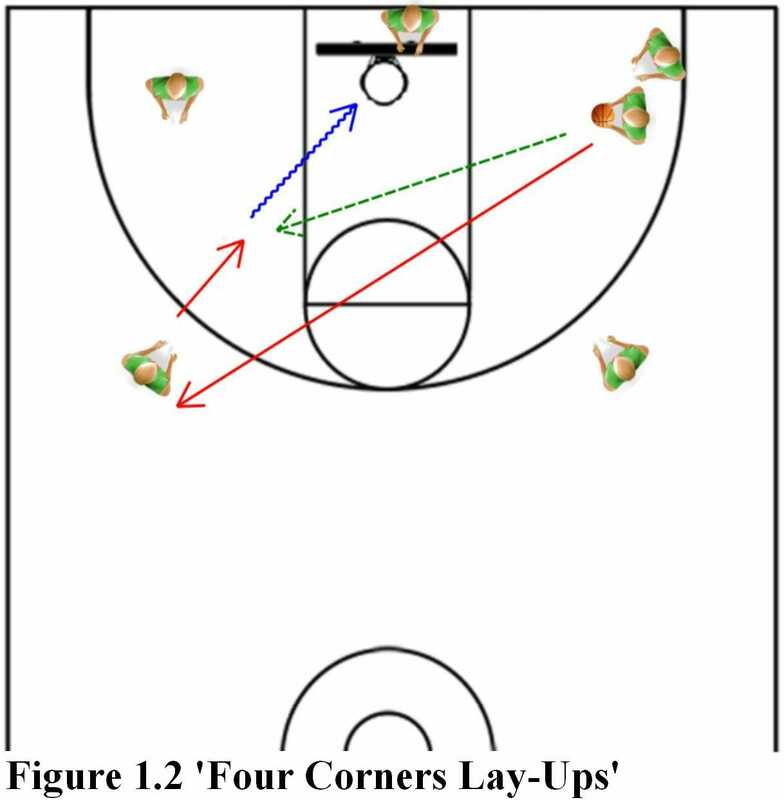 This next pregame warm-up drill starts out with your players lined up underneath the basket. One line is going to have basketballs in it. The other line is shooting. 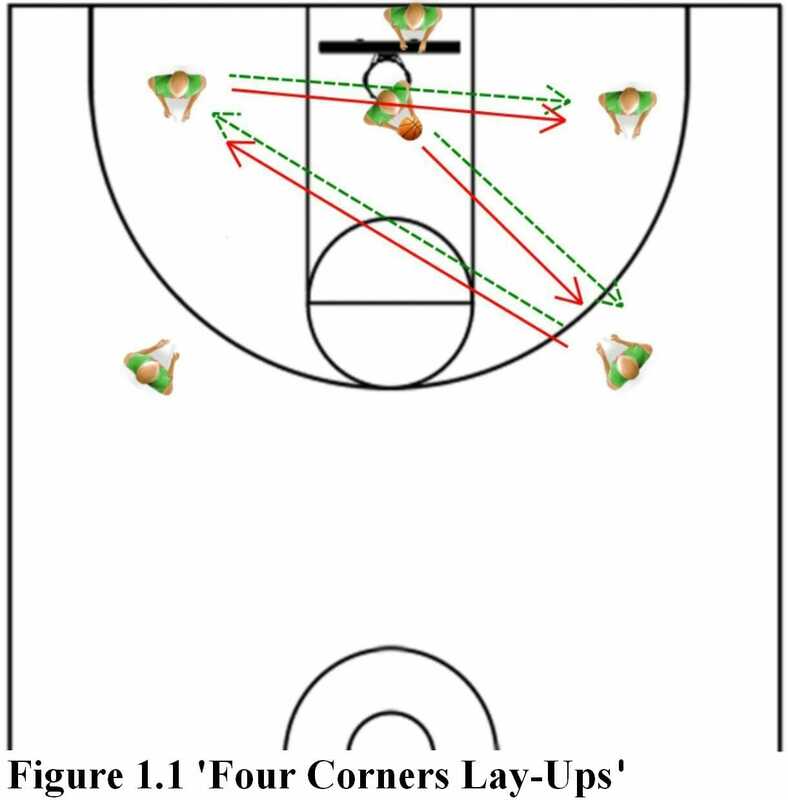 What we’re working on here is not only pivoting and passing and lay-ups, we’re trying to simulate a screening action in a game and popping back to the basketball for a shot. The shooting line is going to run hard out to the free throw line, elbow him, and come to a jump stop. 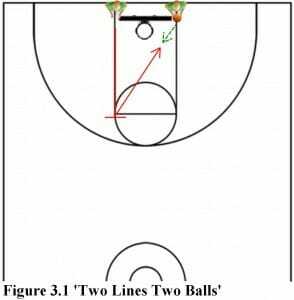 Now, they have the option in this drill to either make a reverse pivot and come back to the basketball for the shot or they can make a forward pivot and come back to the basketball. As soon as they shoot the lay-up, they’re off the floor, they’re going to switch lines. The next group is going to go right after them. Again, you’re simulating the screening action. You’re popping back to the basketball looking to score. 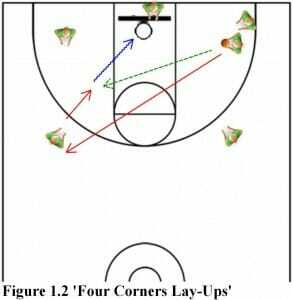 It’s a great way to get warmed up in a game, teaching your players to not only think about screening but also being an accurate scorer after they screen. 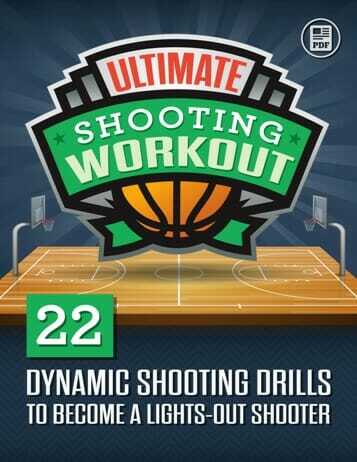 It’s a fast-paced drill. You get a lot of lay-ups in. This is your basic two-line lay-up drill, but we’ve added a passer in the corner now that will simulate a given goal lay-up. As we start out in the beginning, the man in the corner’s going to have to stand for two possessions. But other than that, he’ll pass and make his rotation. We make our pass at the corner. It’s a give-and-go cut. He passes. Gets the ball back. He’s going to shoot the lay-up. The guy who shot the lay-up will continue running on back to the rebounding line. The rebounding line will grab the rebound and immediately fire it out to the next shooter. As I said, this guy in the corner is standing for two because we want to keep the drill moving quick. You want to encourage your rebounding lines to stay out wide and run in. Don’t start sneaking in early. 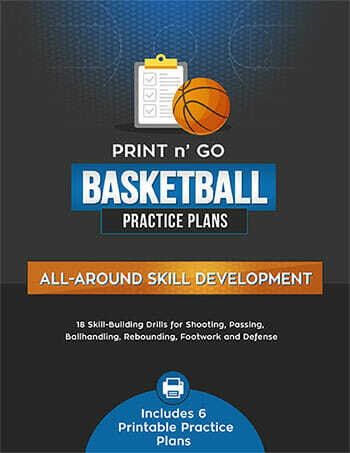 Next step: for our latest practice ideas and tips, check out our main basketball coaching page. 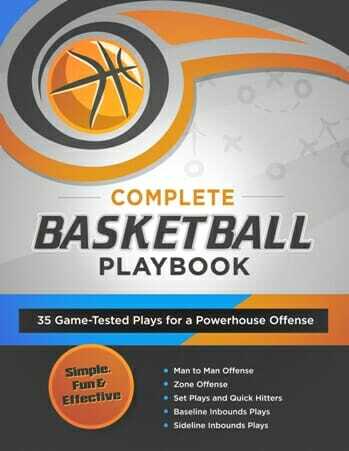 Or, if you’re looking for proven tactics and strategies to give your team the edge, head over to our complete directory of basketball plays.